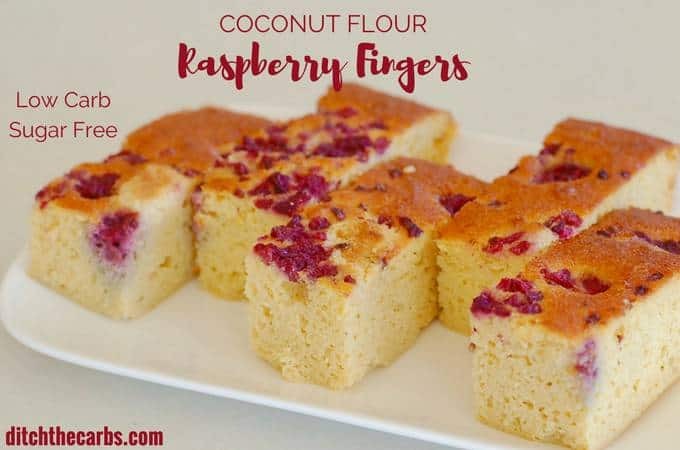 Beautiful sugar-free coconut flour raspberry fingers. 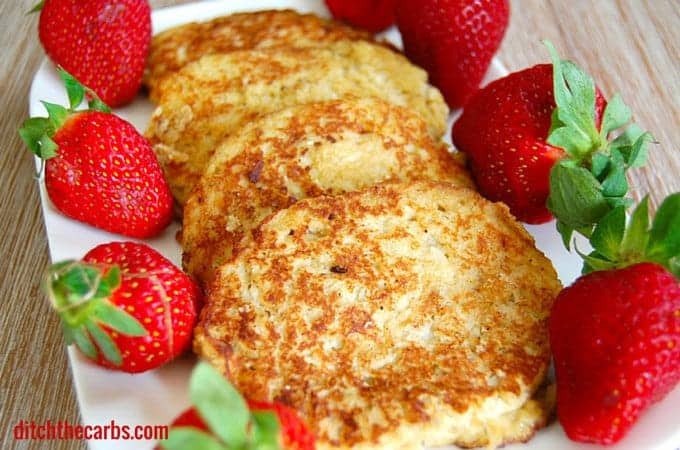 Light and tasty, gluten free heaven without the carbs or sugar. Only 3g net carbs per slice. I have decided this year I will be baking more and more with coconut flour. Why? Read below. And if you want to learn more about low-carb flours, check out my Ultimate Guide To Low-Carb Flours. And scroll right at the end of this post, for other recipes I have already created using coconut flour. Cost – coconut flour is cheaper to use. Prices vary from country to country, and what is currently on sale, but for us in New Zealand, coconut flour is half the price of almond meal/flour. Not only is coconut flour cheaper to buy, the amount you use in a recipe is incredibly small compared to almond meal/flour. A cake might require cups of almond meal/flour, whereas a coconut flour recipe might only require 1/3 of this. Note On Nuts :: “The FDA lists coconut as a tree nut but in fact, coconut is a seed of a drupaceous fruit. Most people allergic to tree nuts can safely eat coconut. 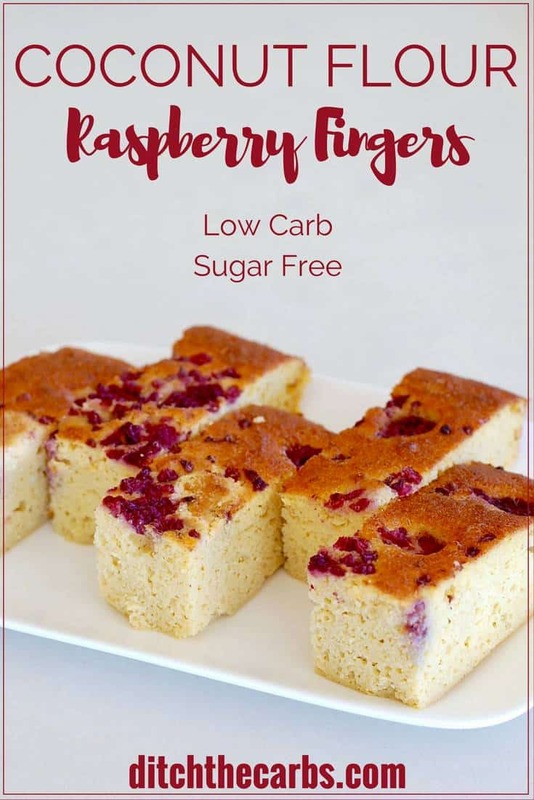 Coconut raspberry fingers are the perfect low carb flavoured sponge recipe. Once you master how to use coconut flour, there is no going back. Pour into a rectangle baking dish, lined with baking parchment. Press each frozen raspberry evenly into the cake. This allows the berries to be evenly distributed and not clump together. It also stops the cake from turning pink! Bake at 180C/350F for 20-25 minutes until cooked in the centre. Once cooled, cut down the centre, then cut across to create the raspberry fingers (or bars). How do i change the recipe to almond flour? OK so I have tried so many low carb/keto desserts and most of them are a total fail. I was skeptical of this one because I thought it was TOO simple… ummm it was delicious. Even my husband loved it. I’ve been eating it for breakfast too (why not??). I’m looking forward to trying different variations, maybe with lemon zest and blueberries? 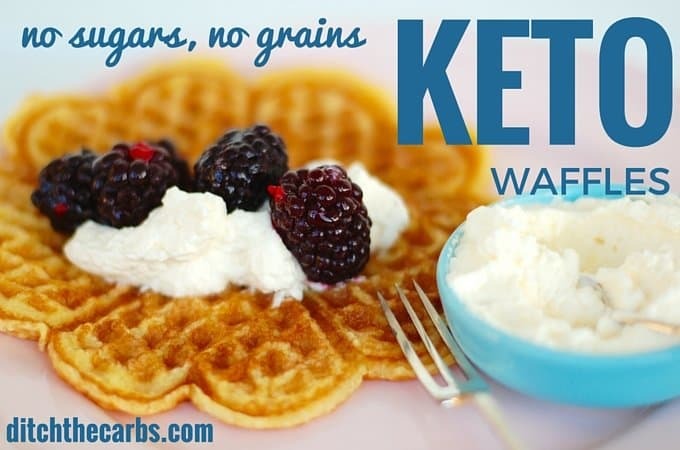 In any case, very excited to have a go-to easy keto dessert that I can serve to others. Thank you! Note: For other readers, I did have to add a bit of extra powdered Swerve(which is less than granular), and a bit of extra coconut flour, but really just a sprinkling. Awesome Loie! If it can pass the husband test (and the breakfast test) then it’s a winner! I want to let you know I tried this recipe again and it worked out perfect! I used 110 grams of butter, 90 grams of coconut flower which is a bit more and 6 large eggs and 3 tbsp of vanilla extract in a 8×9 baking dish and it was a tiny bit spongy but sooooo delicious! Even my very picky teen daughter loved it! Thank you so much!!! Eeeeek … this is brilliant! I tried it exactly like you did and it (more coconut flour and 6 eggs) came out amazingly delicious and perfect. 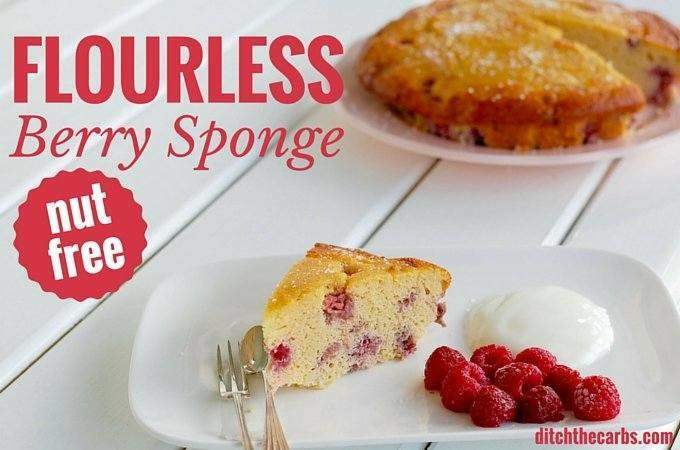 Moist and spongy, not eggy at all. I added lemon cream cheese icing as well. This is now my new addiction. Thanks for the recipe!!! Hi there, I just made this with the US measurements and I’m from Canada which I don’t even know if it’s the same and it came out soaking wet still and I even did 1 less egg. Does this mean I need less butter and less eggs? Since I am not sure what 1 stick of butter meant so translating it on google gave me 1/2 cup which I did but it seemed a lot too and it came out really wet? Under each recipe, there are large red buttons so you can swap between cups/sticks and grams. If it came out wet, it would seem that you might need to check your coconut flour. The quality can vary considerably, so one brand of coconut flour may require an extra tablespoon or two to make the cake batter the right consistency. Coconut flour swells and absorbs so much liquid if the atmosphere is damp and humid, it may also require even more coconut flour to thicken the batter. Thank you for your quick response back. I will try this again but should I only add more coconut flour and keep the same amount of eggs and butter? And the rectangle baking dish does it matter what size it is? Mine is rectangle shaped, for like yellow cakes? Oh that’s great! I will try that! Thank you very much for your help! I’m so excited to try this! I really like this recipe but am struggling for it to not be too moist on the bottom. I am using a 13×9 pan and have increased the recipe to 18 servings. I use farm fresh eggs that are on the larger size so tried to calculate the amount in grams of what 12 medium eggs would be — so it was about 9 eggs that totaled between 515-20 grams. Is that too much egg? I line the bottom of the pan with parchment and am using fresh raspberries as they are in season here. I tried increasing the cooking time to about 30-35 minutes but there was still moisture on the bottom. What am I doing wrong? I would try to add an extra tablespoon or two of coconut flour, that may help. it sounds like you are doing everything right. Too much egg always makes soggy results! I would not exceed 400g of egg. 1 Medium egg is 49g so ur total would be 392. I would go by this instead of adding other items to counteract. Sure! And a little tip is to always taste the baking batter before committing it to the oven. Then you can always adjust the sweetener or flavours to hide any eggy taste. I like to give my cakes a real punch of vanilla. Recipe states makes 12 bars. Enjoy! Help! Hi Libby, please can you help me. I would check your coconut flour! It sounds like it didn’t do its job of thickening and swelling to form the batter. This should be light and fluffy. 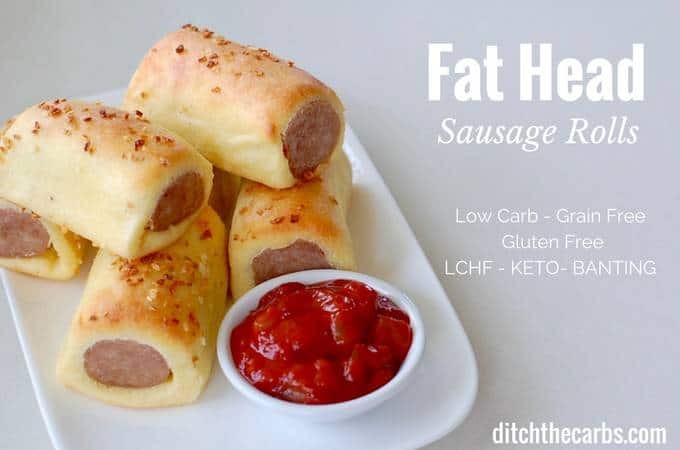 I just made these and they are so good! Instead of using raspberries, though, I used a handful of pecan pieces. They added a nice crunch and flavor. I forgot to add some cinnamon like another reviewer suggested… that would’ve been really good. I used 6 1/2 large eggs and it didn’t turn out eggy at all. Thank you for sharing. Just wondering if you would need to replace bulk if using liquid stevia? Many thanks. Yes, which is why I [refer to use the spoon for spoon sugar replacements such as erythritol. Just made these,. I used frozen. Blueberries. I also added extra sweetener and cinnamon. They turned out great. I’m really excited to have a basic all coconut flour recipe. I think it will be a good base for lots of other desserts. Ooh I like the idea of cinnamon in this recipe. And I do the same, I use this recipe as a basic sponge for many other desserts/cakes/cupcakes. it’s my go-to formula. Did you use medium eggs? I know some readers accidentally use large eggs which may explain why yours tasted eggy. Next time add plenty of sweeter and vanilla – yummmmm. 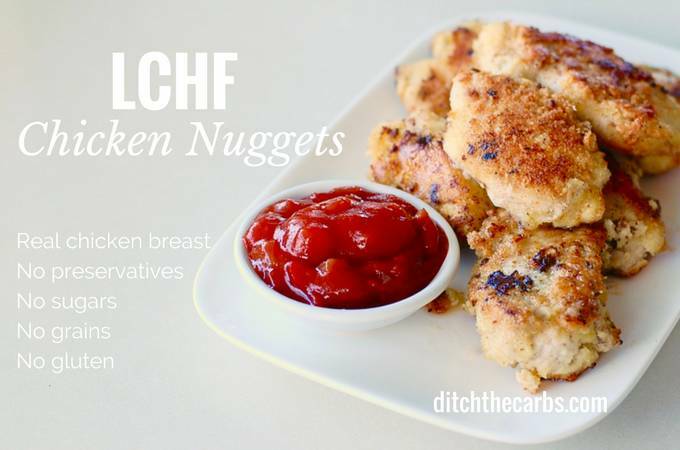 Thanks for another great recipe … these are delicious. I just made this. I was looking for a treat and it certainly was. I did have to cook it for 31mins to get it to set in the middle. The recipe doesn’t specify fan bake or standard bake so maybe that’s it. Thank you, this recipe will definitely become a regular in our family. I made these tonight. Mine were very jiggly after 22 minutes of baking so I increased the temperature to 375 and baked for another 10 minutes after which they were perfectly baked and slightly browned on top. I would say that they are eggy but that doesn’t bother me. There’s a perfect balance of sweetness and tanginess from the raspberries. Hmm, I can’t really give advice on that, it would be a totally different recipe entirely. If you wanted to use up some extra egg whites, I would use this recipe instead. Yummy. Is the batter supposed to be thin and watery-like? 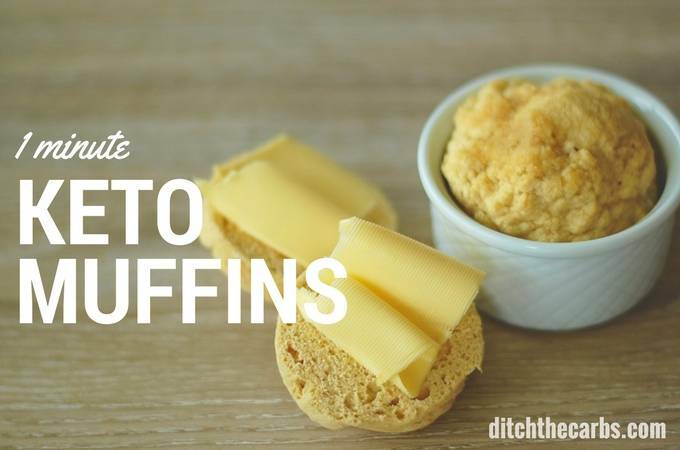 I made this as muffins and the ending texture was good but I was wondering about the batter consistency because my additions sunk to the bottom because the batter was thin and watery-like consistency. No the batter should be a regular cake batter thickness. Check your coconut flour, that doesn’t sound right. Even the eggs would make the batter thicker than water consistency. Something’s gone wrong here. It sounds like it wasn’t mixed enough and too little vanilla was used perhaps. I make this often and have never had an eggy taste (but I do mix and flavour the @$%^& out if it). Give it another go, I’m sure you will have success. I used a cake mixer and I only put in 2 tbsp of sweetner because I have Stevie that is double the strength of sugar but when I mixed the eggs it had little lumps and once it was cooked it was like some of the egg sank to the bottom? I have never heard of this happening before. My initial thoughts are that there is some additive in the stevia which has made the mixture clump together perhaps? I have made this so many times and it has never occurred. So good! I used fresh blueberries. In hindsight I would addfresh lemon zest. These bars were delish! Wow, thank you Judy. I like the idea of lemon zest too. Yes it freezes well. Place in an airtight container and place pieces of baking paper/parchment in between each layer. It did finally cook through and it’s wonderful! Even my sugar-loving husband liked it! Phew, I am so glad. I just answered your previous question. I’m glad it was a success. Did you use an 8 x 8 rectangular pan? Yes, line it with baking paper so it comes out easily. You’ll love this one. 8 X 8 rectangle Is an oxymoron …that’s square? Apologies, I gave yore the dimensions from my square dish. I used my 8×10 dish. Would it taste ok if I didn’t add any fruit to it? It’s delightful without any fruit. I add extra vanilla and make these as vanilla cupcakes. Using a small bread pan will be fine, but it will make it taller (thicker) and so requires a longer cooking times. Cook until a fork comes out clean from the centre. I made these and put in the fridge when cooled. Took out of fridge this morning and there is mold. Don’t feel safe to eat. Is this in fact a reaction and are they safe to eat? If not it is a real waste of ingred. Mold is virtually impossible to grow in less than 24 hours, and in the fridge. Are they green spots? Sometimes this occurs when the baking powder or baking soda reacts with the coconut flour. Do your recipes use salted butter? (I was looking at this recipe and the carrot cake recipe.) If I only have unsalted, should I add salt? I only buy salted butter, but you can easily use unsalted and add a pinch of salt to taste. This grew mould overnight! I kept it in the fridge but took a couple of pieces out for a couple of hours. When i looked at them they had grown mould and when i came home and checked on those in the fridge they had grown mould too! I am pretty sure this is the green colour than can develop when the baking powder reacts with coconut flour in rare cases. I’m researching how to stop it occurring. Same thing happened to me. I did refrigerate as she suggested I do, but it still got moldy. So sad. I have just been doing some research, and from the help of another reader, I have discovered if any green spots appear, it may actually be the reaction between baking powder and coconut flour. If in doubt, always keep in the fridge to help inhibit mould however. I love thathe you started a support group! Sometimes all one needs is a guiding hand. I made this the other night and it was delicious! Does it need to be refrigerated? I left mine out on the counter covered with Saran Wrap and the next morning it was all moldy. Wow, how strange. I don’t think I’ve ever seen mould develop overnight. I have never needed to refrigerate mine, and we reach late 20C here in the summer, although my kids manage to devour it within 2 days generally. For future perhaps, keep it in the fridge. Better to be safe than sorry. I hate wasting lovely ingredients. What can i use instead of any artifical sweeteners or is there no way around it? I use natural stevia and/or erythritol. Both are natural but both processed. This is also true for sugar, natural, but processed. 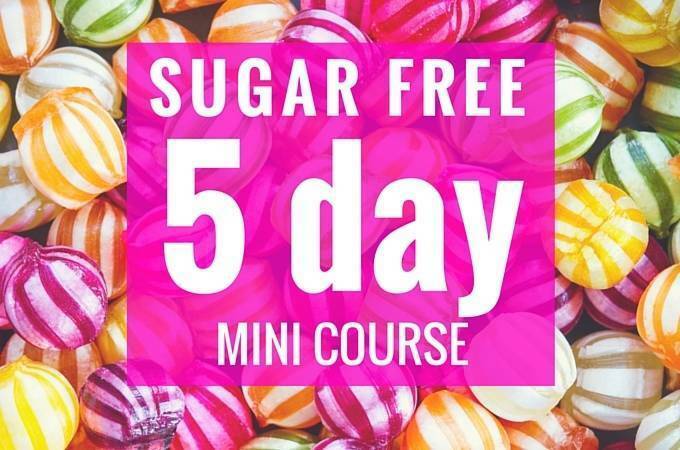 But stevia and erythritol don’t raise blood sugars. 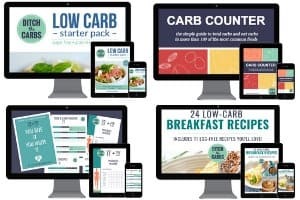 You may want to read this article on the Ultimate Guide To Low Carb Sweeteners. It answers many questions there. If you don’t want to use anything to sweeten this recipe, I think you may find it becomes a little tasteless. You could add extra vanilla to boost the flavour or add more raspberries (but that would raise the carbs and sugars in the cake). Would it be possible to add cocoa powder to the recipe to make chocolate raspberry fingers? If so, how much do you think I should add? And should I add another egg or more liquid to compensate? Thanks! Hmm, that would be amazing but another recipe entirely. If I were to start to adapt it I would add 1/3 cup unsweetened cocoa powder and an extra egg. Mix then see if it is too wet add a teaspoon of coconut flour at a time. If too dry, add a tablespoon of extra liquid (coconut cream perhaps). Then taste again and add sweetener to taste as the cocoa would probably require the recipe to need a little more. Good luck and let me know how you get on. Love your recipes. Can I substitute fresh raspberries, any modifications needed? I love this recipe! I’ve made the slice and today am trying it as muffins. One comment though, at the top it says cooking time 15 mins but in the recipe it says 20 to 25 minutes. Thanks for spotting this, I’ve amended it.